Split Testing is testing multiple versions of your website hosted on different URLs. In your tests, if your Variation is on a different address or has major design changes compared to Control, we’d recommend that you create a Split URL Test. To get started with a Split URL test, go to Split URL under Test on the navigation menu. This takes you to the Split URL Tests dashboard that lists down all the Split URL tests created in the account. To create a new new test, click Create in the upper-right corner of the dashboard. To set up the test, you can start by entering a title by clicking on the pencil icon against New Campaign. Then, select a hypothesis you want to test during the test, specify the page URLs, and define targeting options. Select an existing hypothesis you want to test. Every test in VWO should be associated with one hypothesis against which the results of the test are measured. If you are just starting out and do not have a hypothesis yet, click Create a New Hypothesis to define a hypothesis for testing. To learn more about hypothesis, click here. Next, specify the URL of the pages where you want to include in the test. You can use URL patterns and regular expressions to run site-wide tests and on multiple pages. To learn more about URL options, click here. In the Control text box, type the URL of the original webpage. In the Variation text box, type the URL where the variation is hosted. Click Add Another Variation if you want to test multiple variations. Enter a base URL for the split test views in Enter URL of the page to create previews. This primary or base URL may not be part of a test, but it indicates that the webpage VWO will be used as the primary reference URL for generating previews and default heatmaps. To learn more about base URL, click here. You can define a visitor segment for the test to capture the data of specific visitor groups. You can create visitor segments based on different conditions such as geographical location, user device, and other user behaviors. To learn more, click here. 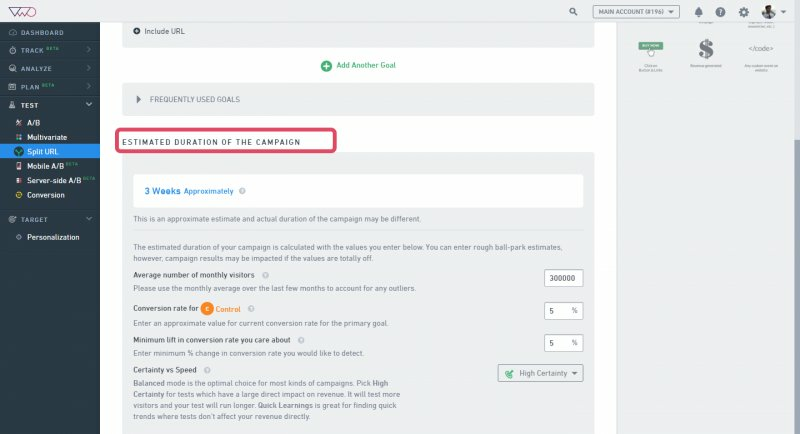 To view segmentation options, select the Enable campaign for a specific visitor group check box. 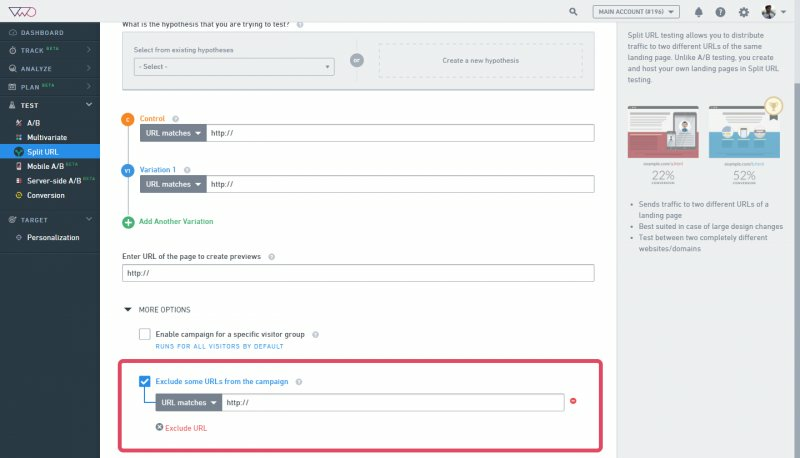 To use a default VWO segment, select the visitor segment you want to target using the Segment Gallery option. To create your own custom segment, select the Custom option to define conditions for a segment. To learn more about creating custom segments, click here. If you are running a site-wide test using URL patterns or wildcard expressions, you may sometimes need to exclude certain URLs from the test. For example, when running a site-wide test, you may want to exclude the Contact Us page from the test. Conversion goals are user activities you want to track on your website. A conversion goal can be clicks on buttons and links, form submits, or just an engagement among others. Goals allow you to compare the performance of control against variations by collecting data to measure the impact on your conversion rate or sales revenue. You can track multiple goals in a single test. Select the visitor activity you want to track for actions such as page visits, clicks on links, elements, engagement on page, and so on. For example, if you have modified a CTA button on a page, you may want to track how many visitors landed on the page and how many clicked the button. Select a URL type using the dropdown and enter URL details for the pages where you want to track the visitor activity. To learn more about different types of conversion goals, click here. Click Include URL to add more pages to the test. Click Add Another Goal to add another activity you want to track. On this page, you can enter the existing data of your test pages to configure VWO SmartStats for the best possible results. Using your current data and the expected conversion lift you want, VWO SmarStats will also give you an estimate of how long you’ll need to run the test. 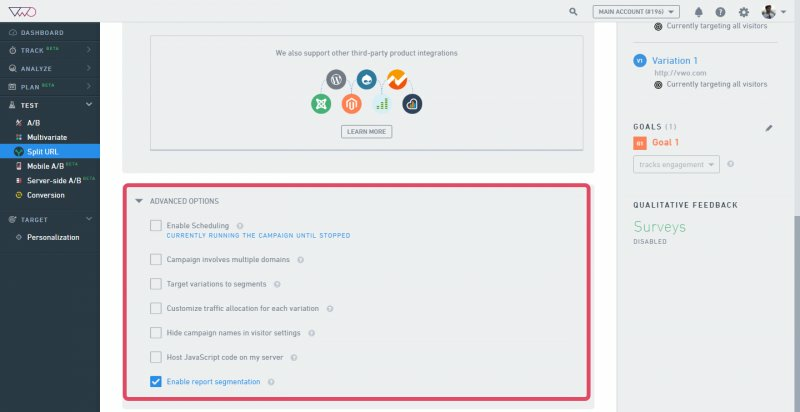 To find out the data regarding your control page, you can refer to any existing analytics tool you are using (Google Analytics, Mixpanel, Kissmetrics, and so on) or run a Conversion Tracking test in VWO to get accurate data. To learn more about VWO Smartstats, click here. Average number of monthly visitors: Enter the average of monthly visitors to your webpage over the last few months. Conversion rate for Control: Enter the current conversion rate of the control page. This conversion rate is specific to the goal you are testing for. Entering the conversion rate of your entire website will lead to inaccurate results. Certainty vs. Speed: Select how you want to configure the test in terms of Certainty versus Speed. Quick learning: Choose this mode for finding quick trends where tests don’t affect your revenue directly. This is the ideal mode when testing non-revenue goals such as the bounce rate and time spent on a page or for quick headline tests. Through this mode, you can reduce your testing time for non-critical tests by deploying a quick winner when there isn’t a risk of hurting your revenue directly. Balanced: As the name suggests, it is the best balance between the testing time and minimizing the potential loss. This mode is used during most of the tests. High certainty: Best for revenue-critical tests when you want to absolutely minimize the potential loss. In general, it takes the longest time to conclude a test. Suppose you have an e-Commerce website and you want to test changes to the checkout flow. You want to be sure enough to minimize the potential loss from deploying a false winner even if it takes a lot of time. This is the best mode for such critical tests, which affect your revenue directly. To finalize your test, click Next. In the final step of the test creation process, you can add notes and labels. You can allocate traffic percentage for the Split URL test, enable integration with third-party products such as Google Analytics, and set up other advanced options that give you more control over the test. Specify the percentage of website visitors you want to include in your test. Click the percentage figure to change the traffic volume or move the slider to increase or decrease traffic allocation. PRO-TIP If you get a lot of traffic to the page you are testing, then you could lower the percentage, but it might take longer to get a concrete result. Enable this option if you want to generate a heatmap report for the test. By default, the option is enable for all tests. To learn more about heatmaps, click here. VWO also lets you push your test data to an external tool. You can integrate VWO with a suite of third-party products to access the VWO data on your preferred tool. To learn more about integrating VWO with third-party products, click here. You can personalize your test even further by exploring Advanced Options. You can schedule your tests to run, pause, or stop at specific times. To learn about test scheduling, click here. 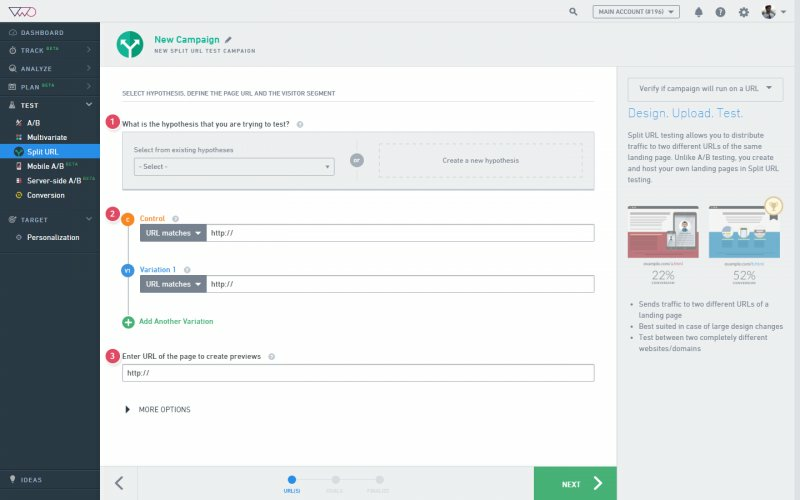 Select this option if your test involves multiple domains and you want to track conversions across the domains. 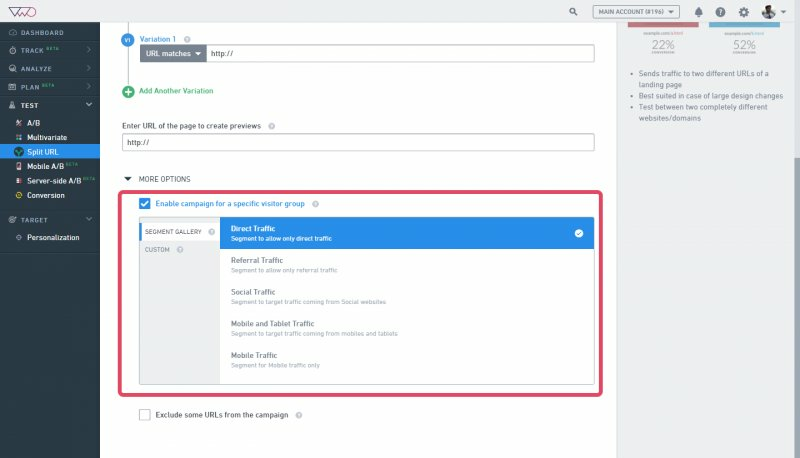 Enabling this option allows VWO to set a cookie that tracks the variation a user has seen, goals completed, and user movement across multiple domains. To learn more about cross-domain tracking, click here. You can target your variations to specific segments based on any of the choices available to you through our Segment Gallery, or you can create your own variation. To learn about targeting variations, click here. You can split your website traffic among the different variations you created for the test. Splitting visitor traffic across variations ensures that all the variations you created are proportionately tested. For example, you may want to split your traffic among three different variations of a test page to find out which variation gets you maximum conversions. To learn more about how to divide traffic amongst each variation, click here. Use this option to replace your actual test or variation information with a standard content format when visitors try to view the information using the “view page source” option in their browsers. For example, if you have a test named “Personalized test for Facebook users,” VWO will replace it as “Test-numerical ID.” If this option is enabled, website visitors cannot view your sensitive details, such as test name and variations name. Please note that you cannot enable this option for the tests that are already running, paused or stopped. If you enable the self-hosting option, VWO automatically disables multi-domain support for that test. Select this option to generate reports, based on different visitor segments. You can filter and view the data of the collected report for various visitor segments to determine which test works for specific segments of your website visitors. To run the test, you need to add the VWO Smart Code to the webpages you want to test. We recommend that you put the code snippet on all pages of your website. Copy the following code snippet and send it to your Developer or you can add it to the webpages yourself. Please make sure to enter your account_id in the code. To learn how to add VWO Smart Code to your website, click here. Congratulations! You’ve successfully created your Split URL Test.